I love making my bros look good in their corporate headshots and professional portraits. In the world of photography it seems like guys get the short end of the stick, and are rarely treated to a professional portrait session unless their wife or mom is dragging them along. But dudes need great portraits too! I’m glad Jerimiah came to me for his corporate headshot and we also made a nice fashion style portrait as well because he’s always looking stylish. Thanks for coming to Paul Bellinger Photography Jerimiah! 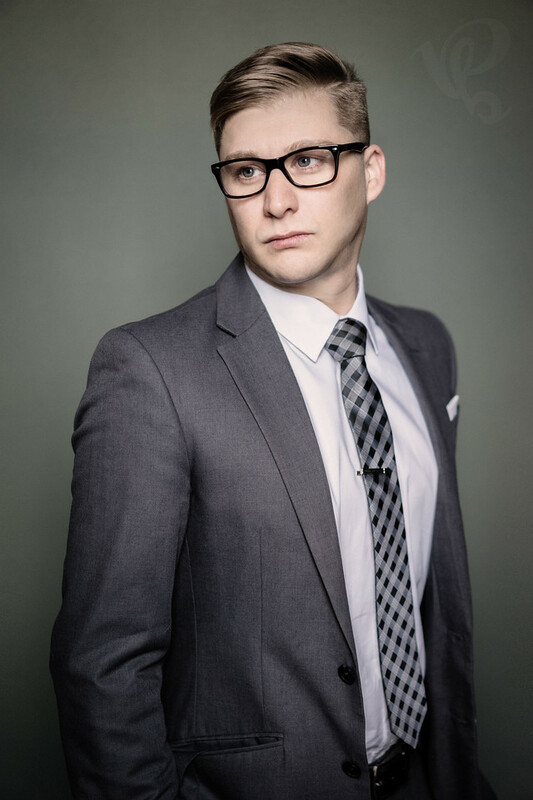 Why get a professional portrait or corporate headshot? A good portrait is something that is becoming rare in the age of the cell phone selfie. But the corporate world still understands that there is no substitute for a professional corporate headshot to help you stand out from the crowd. The right portrait can convey the exact message you want to send to your potential clients, before they ever meet you in person. A portrait can make you look powerful, confident, nice, vulnerable, approachable, trustworthy, etc. What type of message do you want to send your future clients? Wow, these are two dramatically different photos. The first photo is lit with natural light from a single source, a window that Jeremiah is facing, while standing in front of 4’x8’ piece of Styrofoam painted green. I have black curtains on my windows and I can control the size and height of the window light with the help of a clamp or two. In this case I’ve opened the curtains about a two feet or so and clamped at the bottom creating a V-shaped light that is wider at the top. I am standing just to the right of the window so the light has a slight direction to it. I wouldn’t really call this first photo a corporate headshot, it’s a portrait and not very corporate, but I really like it and it would be suitable as a corporate professional photo for someone that is looking to stand out from the crowd. 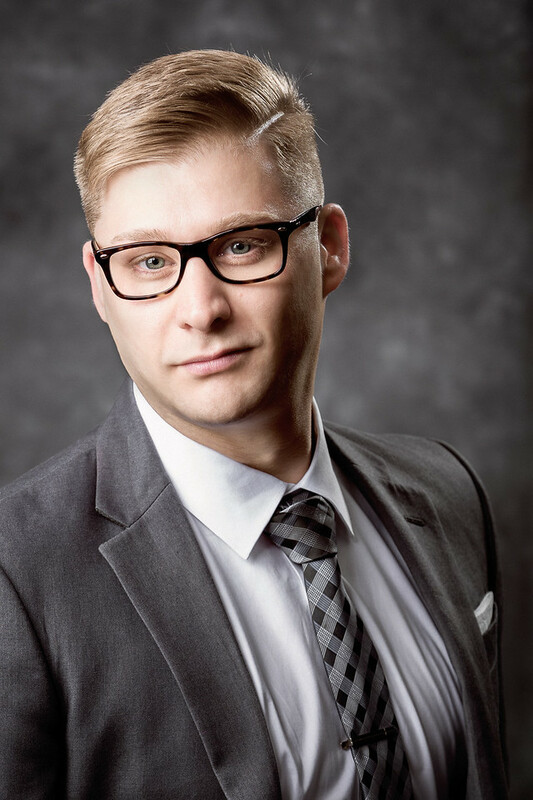 The second photo is a much more traditional corporate headshot lit with four strobes, although a nearly identical look can be achieved with three strobes. The main light is from two light sources, a beauty dish and a four-foot softbox about a foot or two above head height and a few feet camera left (you can see them clearly in the catchlights in his eyes), creating the lighting pattern on his face. I wanted what is known as “short lighting” with the strong shadow to create the slimming and chiseling effect that you get from side lighting (read about broad and short lighting here). The beauty dish gives great directionality but can be a little harsh, so I often like to soften it up with a big softbox or umbrella. The other two lights are very straightforward, a smaller 12 inch beauty dish behind him and camera right above head height creates the kicker highlight you see on his hair, ear and neck. Lastly there is a bare strobe with circular reflector behind Jerimiah lighting up the background. This is a very traditional corporate headshot lighting technique although I made it a little edgier with the directional main light and “short lighting” on his face.